The Kilkenny attacker on their legendary manager not being at the helm for next Sunday’s league semi-final against Galway. KILKENNY ATTACKER EOIN Larkin has revealed that the Cats squad were in shock when it emerged that boss Brian Cody was to take a break after undergoing pre-planned cardiac surgery. It emerged recently that Cody would not be involved with the reigning All-Ireland champions for several weeks. 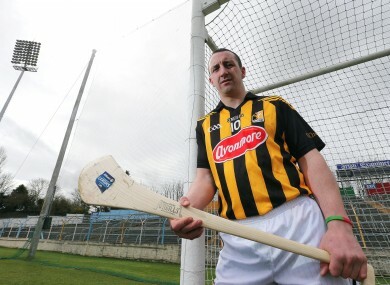 Cody underwent the surgery in the days after Kilkenny’s Allianz Division 1 league win over Cork in Nowlan Park. Kilkenny are getting set to face Galway next Sunday at the league semi-final stage but Cody will not be at the helm. Instead long-serving selector Martin Fogarty and team trainer Michael Dempsey will take the reins. “I found out about an hour before the press release was released,” revealed Larkin. “It was a big shock to everyone, a big shock to me anyway. “But I think he’s doing okay anyway and that’s good news. I can’t ever remember him missing a training session or a match. Larkin has praised the contribution of Fogarty and Dempsey since they took control in the absence of Cody. “The two of them are taking the reins but there was never any main man anyway – the three of them were involved in everything. “It’s seamless to be honest, with Brian gone. The two lads are well qualified and they’re doing a fantastic job so far. “Martin (Fogarty) was in in 2005 but they (Fogarty and Dempsey) were with the U21′s for two years previous so most of the guys know them quite well. Larkin also outlined how the squad have not been sidetracked by the recovery timetable of attacking talisman Henry Shefflin from injury. “There is no real talk about it, but the hope is he will be back. We just get on with our own job and when he’s back he’s back. “I suppose if you starting worrying about is he going to get back, isn’t he going to get back, you’re taking your eye off the ball. Email “Eoin Larkin: 'Cody surgery a big shock to everyone'”. Feedback on “Eoin Larkin: 'Cody surgery a big shock to everyone'”.